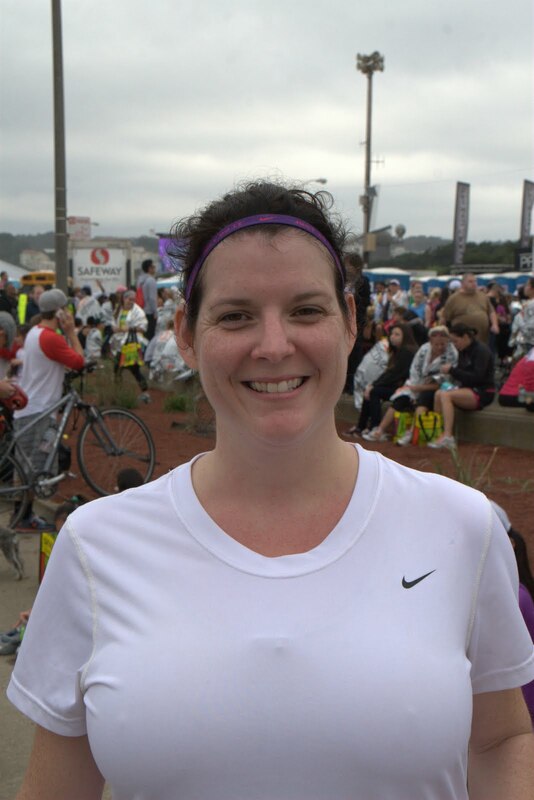 I Am So Not Cool: Running: NWM 1/2 Marathon! After several years of waiting, I finally hopped on a plane with my husband (kids stayed at our house with grandmas) and headed to San Francisco for the Nike Women's Half Marathon! We landed on Friday and headed to the Expotique to get my race bib and goodies (bag, cowbell, samples, coupons). Saturday we wandered around the city (Husband had never been there, I had been there once for work) and got to bed early for the big race on Sunday! I slept terribly on Saturday night. I had a nightmare that I had missed my alarm and couldn't find the start line. I woke up (it was 3:30am Pacific -- 5:30am Central, and my usual wake up time) and set my alarm for even earlier (my husband had also set several alarms.) I fell back asleep to only then dream that I had missed the finish time. So, race morning. I woke up early, ate my usual pre-run breakfast of granola bars, Diet Dr. Pepper (stop judging me), and Claritin, packed my race belt with Gu and water and took off to walk the block to the start line (thank you Priceline!) Husband gave me a kiss and dashed to the spectator buses -- he could catch a bus to see me at miles 4, 9, and the finish. We agreed in advance that I'd see him at 4, around 11 (since the 11 mile marker and finish line were actually near each other) and then at the finish. The start line energy was fantastic. I may have actually cried a little bit during the national anthem. Then they started Beyonce's "Run the World (Girls)" and 12 minutes later I crossed the start line along with 20,000 other women and 2,000 extremely smart men! It wasn't too cold in San Fran and though I started off in a shirt, shorts, ear covers, and jacket, I took the jacket and ear covers off about .5 mile in. I also took off fast! The first two miles were all downhill and I was trucking away! 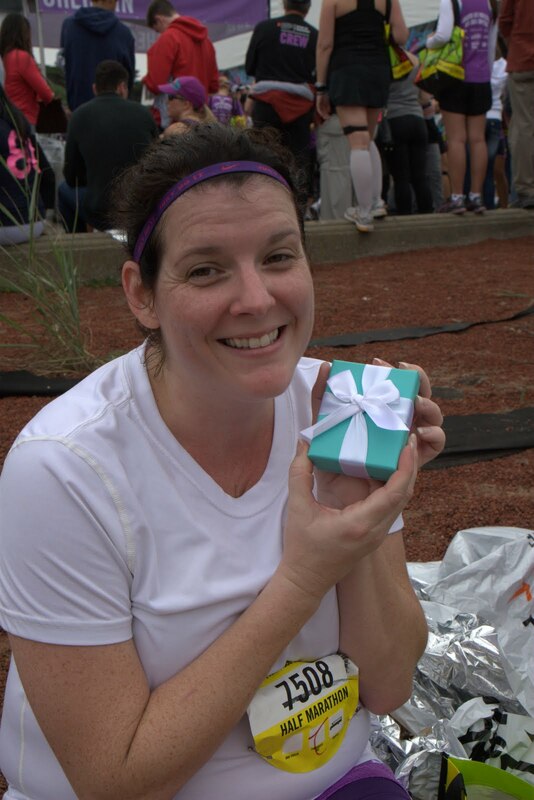 My realistic goal for the race was to run it in 3 hours flat, and my stretch goal was to run it in 2:45. I needed to average a little under a 14 min mile to accomplish that, and my first three miles average pace was 12:45 -- way too fast for me. I ran through downtown and to to the wharf area that Husband and I had explored the day before. If you've never run a race like this, it's just so energizing. People cheering, everyone around you running and encouraging you to run, being handed water and goodies along the way. It's an uplifting experience and it's hard not to get caught up in the momentum! My usual strategy for races like this is to walk up any steep uphill -- there's a point of diminishing returns when running uphill where walking is faster and expends less energy. The first hill appeared around mile 3 and I walked it, as most everyone around me also did. I ran past the four mile marker cheering station and did not see my husband. So I called him. He didn't answer. I ran along and saw him a little while past that and handed him my jacket and ear covers. And off I kept going! Around mile 6, there was another good view of the Golden Gate bridge, so I took a picture of that too. When you run a marathon, mile 18 is called "the wall" because more people quit at mile 18 than any other point. I don't know if the half has an equivalent, but for me it's mile 9. At the 9 mile mark during my 14 mile run two weeks before the race, I was mentally done. I wanted to quit. Fortunately, I was three miles away from my car and the fastest way to get there was to run. And if I'm going to run three miles, I might as well finish the run! So, I took a little walk break, drank some water, and carried on! During the half marathon, mile 9 was the start of another freaking hill. I don't know if you are aware of this, but San Francisco is hilly. Central Texas is not. Texas is hot, and in my mind I was hoping that might equal out for me on race day. Somewhere around mile 8 or 9, the aid station passed out orange slices which helped me think refreshing thoughts. Kaiser Permanente sponsored a mile and had signs that listed reasons for running (1. The Necklace.) I powered through my hard points and carried on through. I also got to see the ocean, and took its picture. Safeway sponsored a mile between 10 and 11 and had signs on the road that said things like, "Safeway knows you can do this. . . . we know how you didn't sleep in all those mornings," which made me a little teary because I really, really love sleeping in. Around mile 11, before the start of a really big hill, they had another sign which said that Safeway know you could do this because you already went over the biggest hill. Which wasn't as comforting, really. Run like you are late for a shoe sale! Less sign reading, more running! When I got to mile 11, I got SO EXCITED! I was only TWO POINT ONE miles away from the finish. I began running faster! And I couldn't believe people around me weren't running faster too! Didn't they know we were almost there?! Near mile 12, the full marathoners split off and I thanked Baby Jesus that I was only doing the half marathon. Ghirardelli had a chocolate station at mile 12, so I slowed down to eat a piece, and then picked up the pace! Trucking towards the finish line, I put on Lady Gaga's "Edge of Glory" and pushed myself to the finish! With a tenth of a mile left, my freaking iPhone battery ran out! Annoyed, I removed my earphones from my ears, turned the corner, saw the finish line and ran like a crazy woman pretending to hear Lady Gaga in my ears! 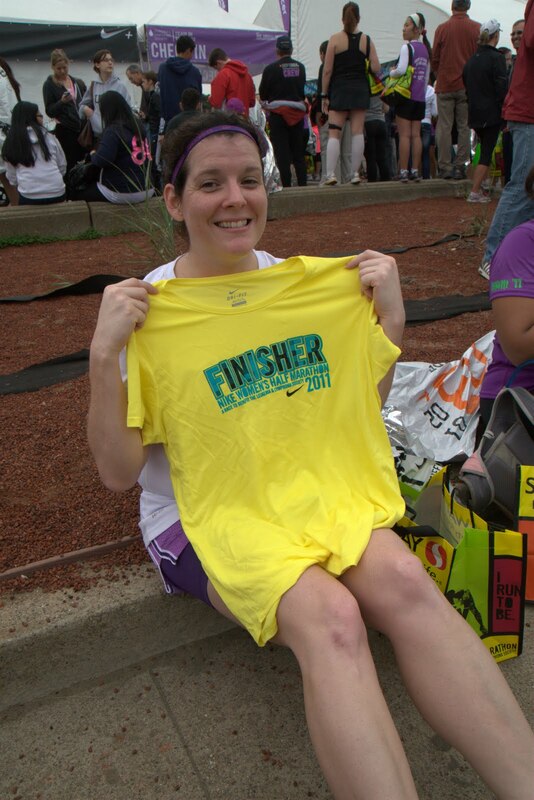 I crossed over the finish line all smiley. I received my Tiffany necklace presented to me by a fireman in a tuxedo, but sadly couldn't take any pictures of the moment due to my stupid dead iPhone 3GS. I walked towards the herd of people and received a finisher's t-shirt, bag to carry my stuff in, water, bagel, and thermal blanket. I then realized that I had no idea where my husband was and couldn't call him. A random San Francisco woman lent me her phone and saved the day! I got to sit down, which was amazing, and opened my new necklace! All in all, this was an excellent race -- the scenery was gorgeous, water and aid stations were many and plentiful, and the spectators and runners were gleeful and fun to be with! 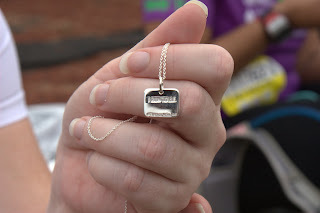 Also, did I mention there was a Tiffany necklace at the finish line? I'm totally spoiled now! My finish time was 3:02, but I figure that the extra two minutes over my goal to take pictures and eat chocolate was time well spent!